Energy harvesting in wireless sensor networks is critical to minimizing, or even eliminating, the use of battery power for individual sensor nodes. Once the energy source is converted to an electrical output, nearly all sensor nodes will have some element for storing the electrical current. This could be a super-capacitor or a very small battery. In some cases, the sensor node will operate directly from the converted energy source and only remain active for as long as the source is producing electricity. As a reference, below are some general energy harvesting amounts which can be obtained from common sources. These are highly dependent on the specifics of the placement, actual environment and harvesting technologies. 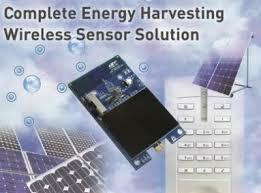 The additional expense of including the energy harvesting element (e.g., photovoltaic cell), managing the conversion to usable electricity and storing the electricity is generally offset by the reduced cost of eliminating or reducing the battery in a wireless sensor node. A slightly more difficult cost savings to measure is the expected life time of the sensor node, as it is no longer dependent on the battery life for providing energy. In effect, the sensor node can operate indefinitely using harvested energy. In practice, this may be limited to years or decades of use as other elements of the sensor node may fail. In factory automation and machine systems an energy harvesting system can take advantage of by products of the motors – namely vibration and heat. Monitoring systems for the various equipment are most often located in close proximity, or directly attached, to these excellent sources for energy harvesting. Even a very efficient motor will still give off sufficient heat to power a sensor node. And while dampening systems reduce vibration from a motor to the external system, the motor assembly itself will still have in the best case some motion. The advantage in this scenario of using harvested energy rather than dedicated power used by the system being monitored is two-fold. First, there is no incremental cost to add a power line to the sensor since the energy harvesting is external to the system. Second, the power for the sensor is independent of the system being monitored. Another area for energy harvesting is found in smart buildings. It is now cost effective to include a large number of wireless sensor nodes throughout a large building or complex to monitor key physical parameters such as temperature, sunlight, humidity, vibration and usage (e.g., motion sensors in conference rooms). With two way communications, a node can adjust the building for optimum efficiency. For example, window shades in office buildings can automatically open or close based on the amount of sunlight, reducing heating and air conditioning costs. New windows are able to electronically darken / lighten to achieve the same result. Vibration monitors in elevator shafts can determine possible wear out conditions for cables. A third scenario is for wide dispersal of nodes over a large geographic area. This is useful for measuring environmental conditions in deserts, on polar ice fields or in oceanic beds. To gauge the applicability of using energy harvesting in a particular application it necessary to calculate the sensor node’s average power consumption per activity. In general, this is the amount of energy required for a measurement along with the energy to communicate the observation, multiplied by the number of times this occurs. At one extreme are ultra low power sensors used for weather and environmental monitoring. As an example, a pH sensor monitoring acidity levels in kelp bed floating at sea may require 50 uW of total power. Transmitting the data may require an additional 100 uW. A measurement and transmission cycle would require 150 uW of total power. These are very low data rate and very low cycle time for how often measurements are taken. A more common example is a wireless module coupled with an energy harvesting element that can provide higher data bursts and take measurements more frequently. This requires module which is optimized for low power data transmission (and reception for two way communications) and a very low power usage during non-active times. The ” XBee Wireless Solutions ” from Digi have been developed to meet the low power needs for wireless communications. What is advantageous to their solution is that they can provide a greater communications range while consuming power in the milli-watt range. This is about a 10x improvement over competing solutions, and makes this a viable solution for energy harvesting applications, as well as standard battery systems. Range is maximum of 90 meters. Digi also offers a ” XBee DigiMesh 2.4 ” module which communicates at 2.4 GHz using proprietary protocols and has similar power and range specifications. Recalling the earlier table for energy harvesting sources, there is sufficient power available through either sunlight or wind to continuously power a wireless sensor node built with the Digi XBee technology. Using other ambient sources, it would be necessary to harvest and store energy between measurement and communication cycles, but it is still realizable for practical applications. In conclusion, wireless sensor networks powered by energy harvesting can provide a significant cost benefit over the lifetime of the application. There is also a significant initial cost advantages by not requiring wiring, and the installation cost of wiring, to power and communicate with the nodes. These devices can be deployed in many new areas for service which were previously not accessible due to power limitations. Finally, with off-the-shelf modules it is easy and quick to develop both a concept and a fully deployable network.